When Tessa's best friend organises a surprise TV makeover, Tessa is horrified. It's the last thing she needs - her business is on the brink of collapse, her marriage is under strain and her daughter is more interested in beauty pageants than student politics. What's more, the 'Greenham Common angle' the TV producers have devised reopens some personal history Tessa has tried to hide away. Then Angela gets in touch, Tessa's least favourite member of the Greenham gang, and she's drawn back into her muddy past. Moving between the present and 1982, and set against the mass protests which touched thousands of women's lives, Love and Fallout is a book about friendship, motherhood and the accidents that make us who we are. Kathryn Simmonds has proven that her talents stretch beyond that of writing award winning poetry with this skilfully written debut novel. Tessa is a likeable narrator whose real-life struggles provide much for women to relate to. The sections of the story set in 1982 are vivid with descriptions of camp life which reveal how well-researched the book is. Simmonds has created a cast of memorable female characters who find themselves at the protest camp for different reasons. As a reader who knew very little about this period in history I felt that the author brought the camp to life, effectively describing the various power structures and relationships between characters. The book is thoughtfully conceived with wholly believable characters. 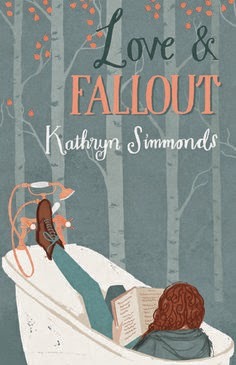 Exploring the formative experiences of youth, alongside living the activist lifestyle, Love and Fallout is an accomplished first novel from a writer I hope to see more from. This review first appeared on the Literature Works website.